An employee of a think tank owns a house in the Capitol Hill neighborhood of Washington. He wants to refinance his mortgage, but the bank won’t give him a loan. It is perhaps not the most shocking story in the world, but it becomes so when you learn that the think tank employee is Ben S. Bernanke, who was until earlier this year the chairman of the Federal Reserve, charged with setting the course of interest rate policy for the United States economy. And it seems downright absurd when you consider that he now makes a reported $250,000 for giving a speech and has signed a book contract that is surely in the seven figures. His income this next couple of years will surely dwarf the value of his house (he and his wife bought it for $839,000 in 2004, and it is currently assessed at $815,000, according to District of Columbia property records). The problem probably boils down to this: Anybody who knows how the world works may know that Ben Bernanke has vast earning potential, and that he is as safe a credit risk as one could imagine. But he just changed jobs a few months ago. And in the thoroughly automated world of mortgage finance, having recently changed jobs makes you a steeper credit risk. 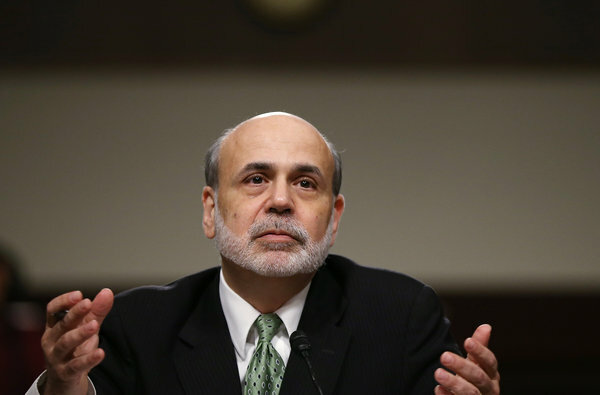 That would seem to fit Mr. Bernanke to a tee. He recently ended 11 years of steady employment with the federal government, during which he earned a steady salary. Now, while his earning potential is vast, it is irregular, with an unpredictable stream of revenue from speeches and book advance payments. At the event in Chicago, Mr. Bernanke was using his own refinancing difficulties to make a point that mortgage credit may still be tighter than it should be. But rather than a simple matter of tight versus loose, the real dynamic in the mortgage market right now may be one of a lack of flexibility. Fannie Mae and Freddie Mac, the government-owned mortgage companies, now dominate the market for loans, so banks must meet their strict standards for any loans they wish to sell off to them at favorable interest rates. And banks themselves are under pressure from regulators not to take major risks on their balance sheets. More broadly, the old-school model of what it means to apply for a mortgage — go down to your local bank and have a loan officer meet with you and try to judge whether you are likely to repay the mortgage — is very much a thing of the past. The more automated mortgages have become — based on formulas tied to credit scores and employment histories — the less room individual lenders have to use sensible judgment to conclude that, just maybe, the nice man with a beard who looks vaguely familiar and seems quite certain he will make plenty of money to make his mortgage payments might be a good credit risk, no matter what his employment status says. Posted on October 6, 2014, in Postings. Bookmark the permalink. Leave a comment.